Discussion in 'iPhone and iPad Games' started by Dunan, Oct 14, 2015. 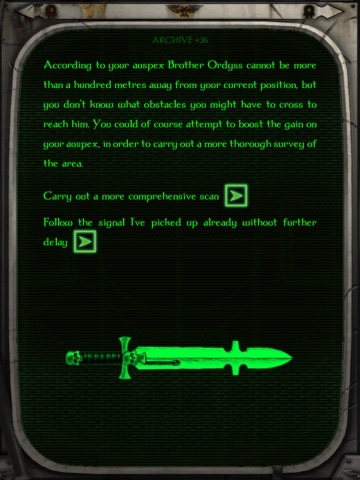 A vast choice-based digital gamebook set within the Warhammer 40,000 universe where you are a Space Marine! ** REVIEWS ** "Another solid turn from Tin Man, Legacy of Dorn uses its licence well, and shakes things up enough to make it feel fresh." - Pocket Gamer - 8/10 - Silver Award "Legacy Of Dorn: Herald Of Oblivion is an enjoyable, creepy adventure with a great setting and a fun combat system." 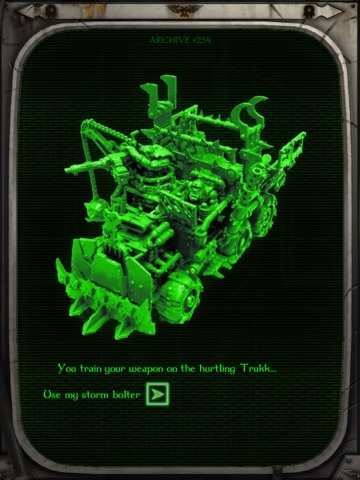 - Touch Arcade - 4/5 stars "Anyone who loves all things Warhammer, or is into sci-fi literature of any sort, should snag this ASAP." - MacNN You are a veteran Space Marine of the Imperial Fists Chapter. Equipped with powerful Terminator armour and armed with the deadliest weapons that the Adeptus Astartes wield, you are a symbol of the Emperor's might. Trapped aboard the space hulk Herald of Oblivion and the only survivor of your squad, you must fight your way through the aliens and heretics that infest the star vessel and find a way to escape the horror and return to your Chapter. 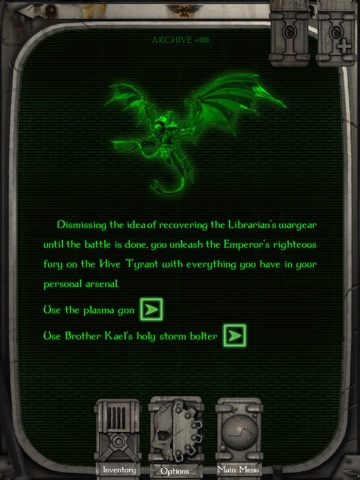 ** FEATURES ** •Read the gamebook by transforming your iPhone or iPad into an Imperial Cogitator! 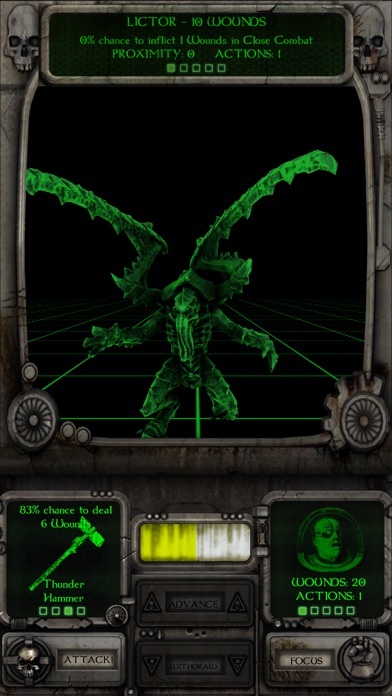 •Holographic combat simulator brings the player face-to-face with the myriad of lifeforms on the space hulk! •Advance or retreat! Fire weapons from a distance, or move in for close combat. 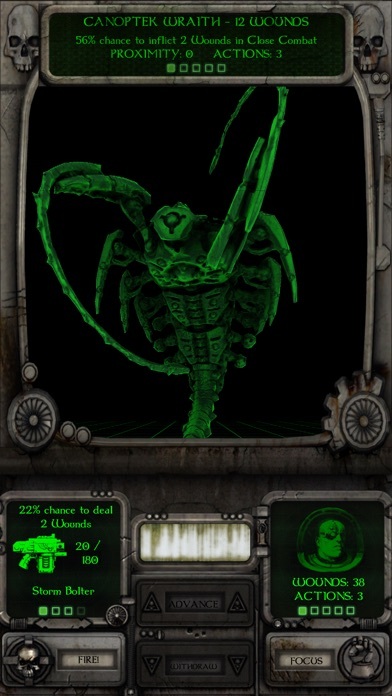 •Encounter Orks, Tyranids, Dark Eldar, Necrons and more as you explore the Herald of Oblivion. 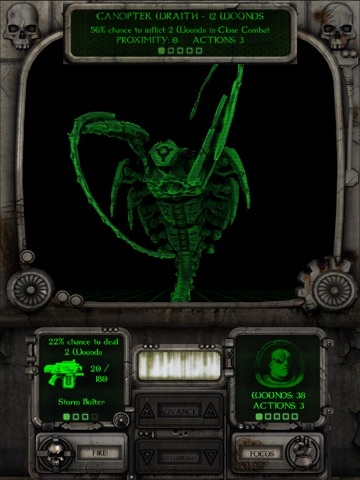 •Access the Xenos Archive to keep track of monstrous creatures you destroy. Herald of Oblivion is adapted from the gamebook written by Jonathan Green and was originally published by Black Library/Games Workshop. 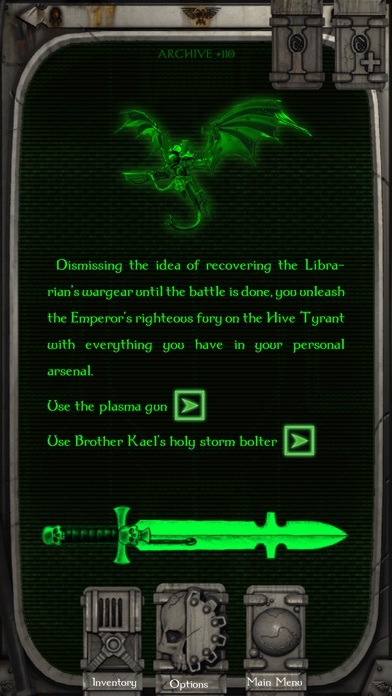 This is part one of the Legacy of Dorn trilogy. Part two, Pits of Commorragh, coming to the App Store in early 2016! Legacy of Dorn: Herald of Oblivion © Copyright Games Workshop Limited 2015. Legacy of Dorn: Herald of Oblivion, the Herald of Oblivion logo, GW, Games Workshop, Space Marine, 40K, Warhammer, Warhammer 40,000, 40,000, the ‘Aquila’ Double-headed Eagle logo, and all associated logos, illustrations, images, names, creatures, races, vehicles, locations, weapons, characters, and the distinctive likeness thereof, are either ® or TM, and/or © Games Workshop Limited, variably registered around the world, and used under licence. All rights reserved. Immediately bought. Very eager to test the new battle system. Hopefully picking this up tomorrow, need to recharge my credit. Let us know your impressions of it. Definitely picking this one up tomorrow. The flickering green does my eyeballs in. Seriously needs an edit too - I spotted "xenon" instead of "xenos" in about thirty seconds flat. Seriously needs an edit too - I spotted "xenon" instead of "xenos" in about thirty seconds flat. Gah! Naughty auto-correct in our gamebook editor being pesky at the last minute. We've just fixed that! If you go back to the main menu and let the app download an update they will all be fixed. Hi! I am a huge fan of your games, bought this one as soon a i could, have almost all of them! I noticed a problem with FEAR, the music don't work in my iphone 6 with ios 9, but work in my ipad air 2 with ios 8! I don't tested with other games, but i am waiting to play after a possible fix. Do you guys are aware of the problem? Thanks! And sorry for any mistakes, english is not my native language! Bah cup bah bush bah! I'm friggin lovin' it. 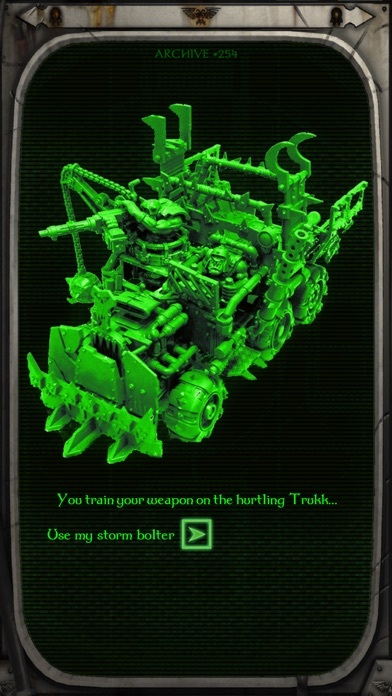 I love all things 40k...but some of the apps have been underwhelming...not this one! So fun, so far. Just into the first part of the hulk, Great writing and fun battle system. Also, this is my first buy from this company, definitely looking forward to trying other's in the future. Thanks for the heads-up. We've actually just replicated this bug in the office so will add it to our bug list to sort out as soon as possible. Thanks! 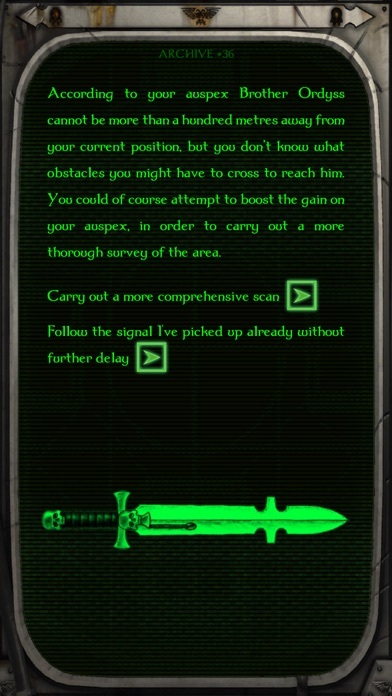 I just tried some other games and catacombs of undercity has the same problem. Maybe you guy should test other titles! Congrats on the new game and good sales! Edit: rema, necromancer, and spider god have the sound problem too. Assassin in orlandes works great. Didn't test others. Sorry for pointing problems, love your games! You guys would have been in trouble back in he early 80's when mono-green displays were just about the only option for any PC/terminal. As a representation of a marines HUD, I think the style is spot-on. Tin Man Games releases are always instant purchases for me. What a treat to find this! Played through 5 times already. Love this game so much. Yes I know it's based on a novel, but I love the ending. I really enjoy the combat system and the item choices you need to make, although I'm unsure of the point of the knife, there never seems to be a need for it. This game captures the grim dark feel of 40K so much better than so many other titles released this year. The save system is also very forgiving and useful if you're a bit of s completion ist. An absolute must for anyone into game books or 40K. I this looks cool and I would love to try it but I have never played a game book before in my life. So I don't know, 6$ is a lot to try something I know nothing about. Looks so cool though and I love warhammer games. Wow. That's some review! Thank you very much. It's probably less than you spent on lunch, right? Tin man game books are awesome! I just wish you could invert the colors on this one. You could always check out the other Tinman games. The 12th one, they just realeased looks great, and Shaun mustread, from TA gave it an excellent review.